Yesterday we reported a TENAA listing of two unannounced Gionee smartphones - the S9 and S9T with the only difference between the two being the higher processor clock speed of the T model(2.0GHz vs 1.8GHz). 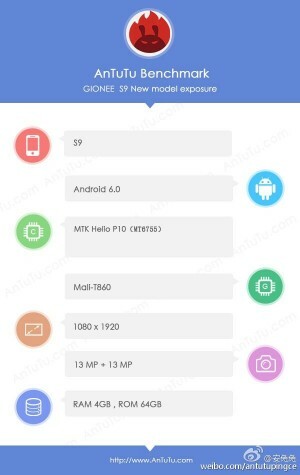 Today an AnTuTu screenshot which allegedly comes from the Gionee S9 confirms the specs we saw from the TENAA leak. The Gionee S9 is powered by a MediaTek Helio P10 chipset with eight cores, a 1920 x 1080px display, a 13MP+5MP camera duo on the back, Android 6.0, 4GB of RAM and 64GB of built-in storage. The rest of the specs we've heard about are a 5.5-inch display size, 13MP front-facing camera, 3,000mAh batteries, 154.2 × 76.4 × 7.4mm dimensions and 166.5g of weight for the Gionee S9 and 200.8g for the Gionee S9T, respectively. There's still no word on the eventual availability of the Gionee S9 and S9T but the S8 was announced at this year's Mobile World Congress in February so we could be looking at a MWC unveil in the beginning of 2017. Thanks, Akshay for the tip! If Gionee can give 2.2ghz in P7max with helio so anything would be possible. lol Helio P10 is a joke.